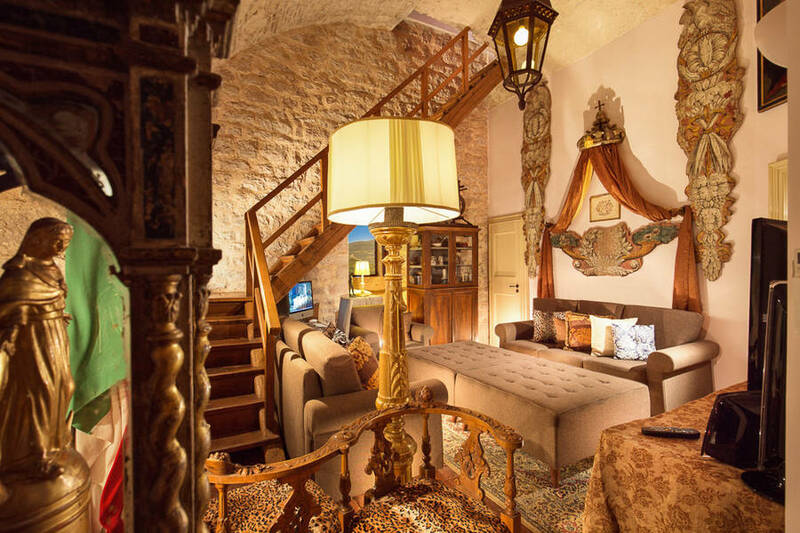 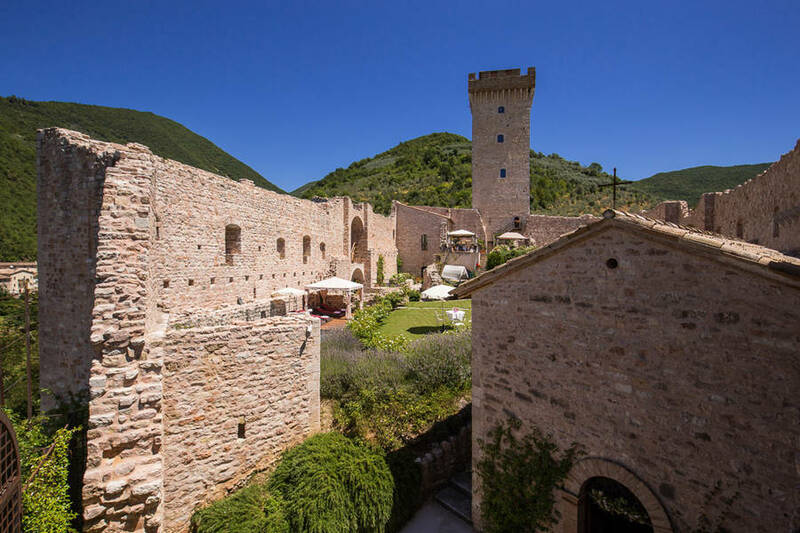 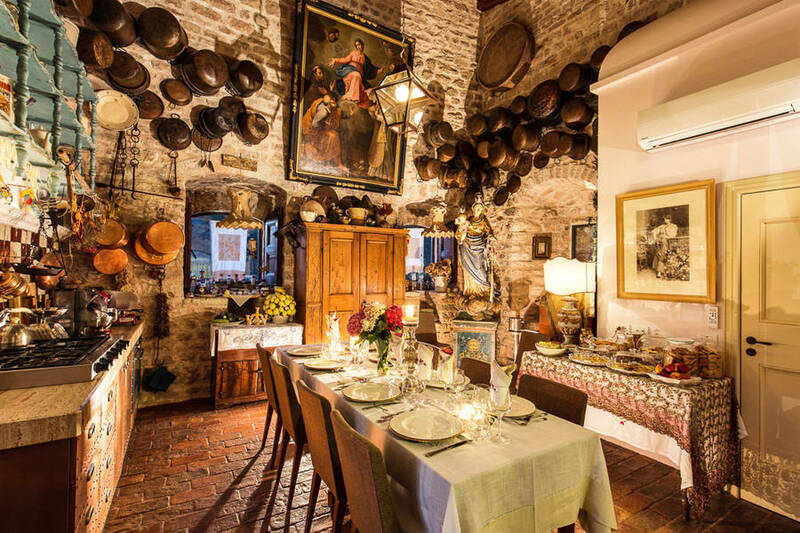 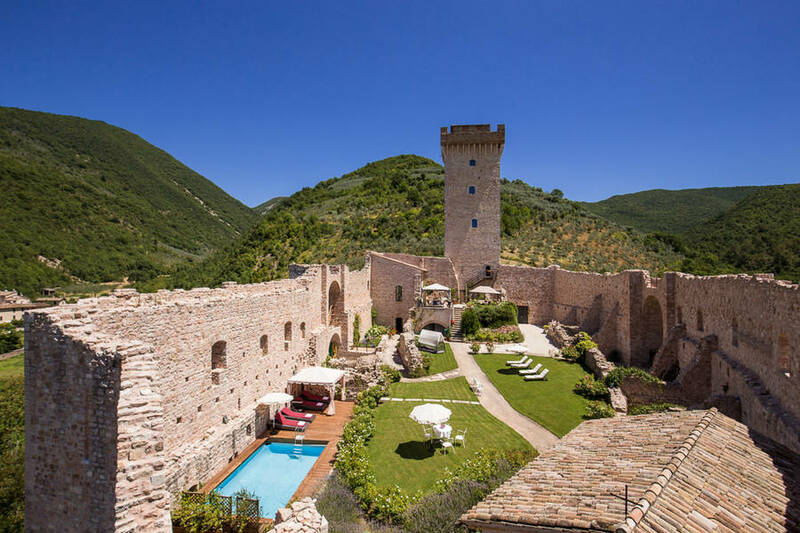 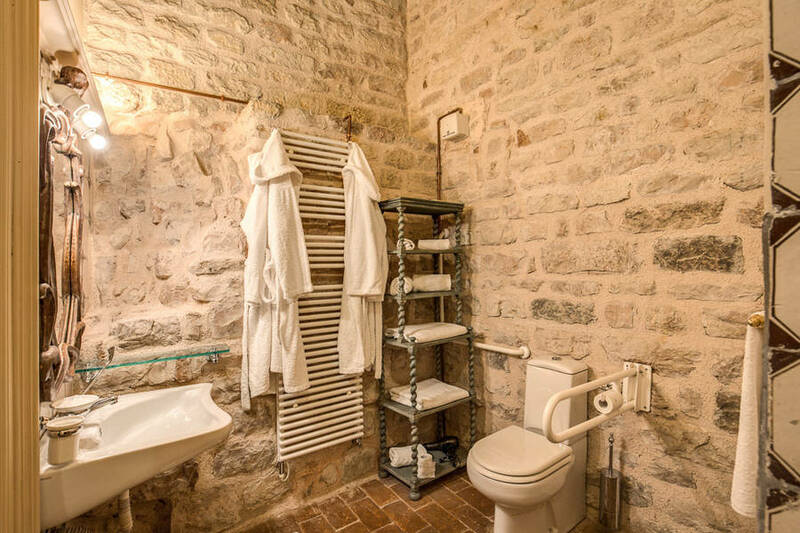 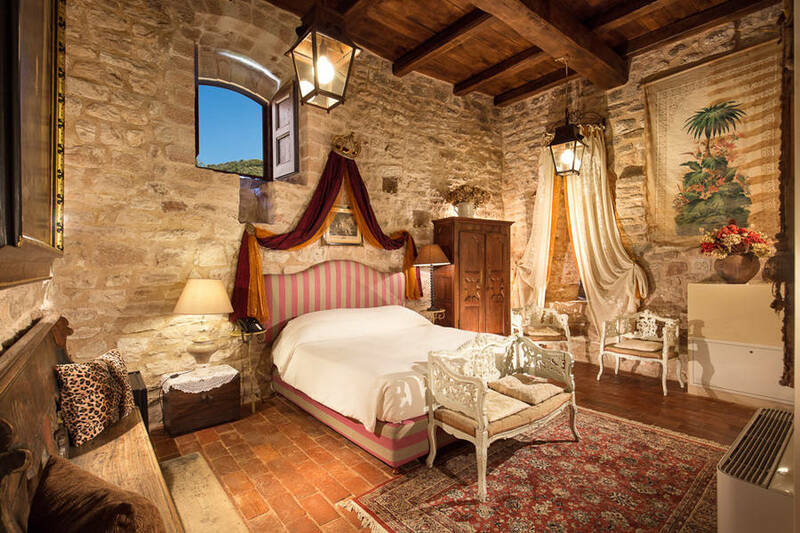 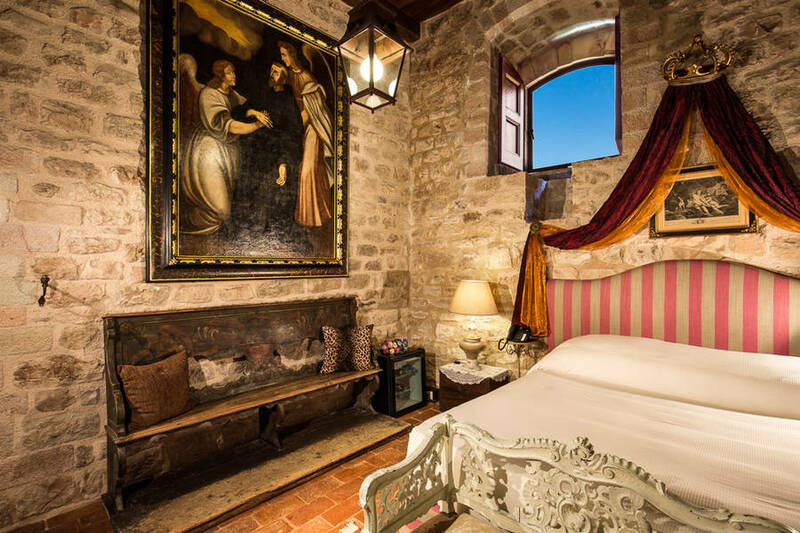 A vacation fit for a king requires a regal accommodation, and nothing could be more fitting than the watchtower of a 14th century castle in Umbria. 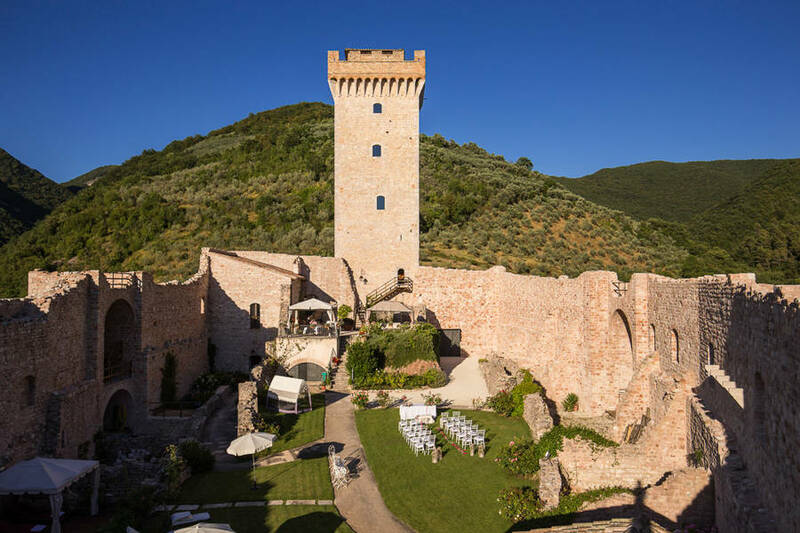 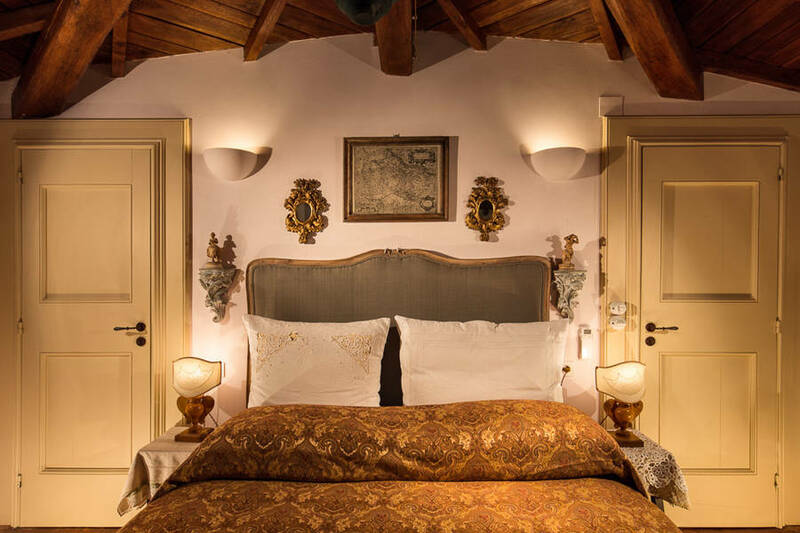 Experience the unique and unforgettable thrill of travelling back in time in this tiny realm called Rocca dei Trinci, where you will be pampered like royalty. 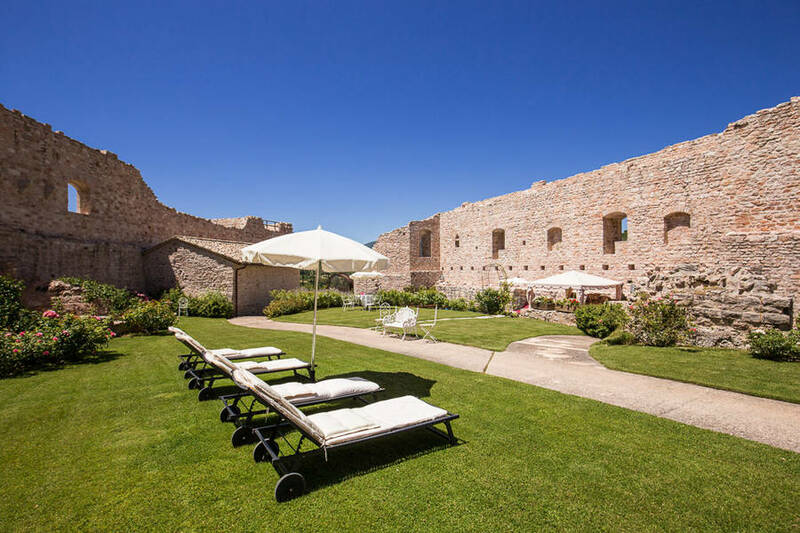 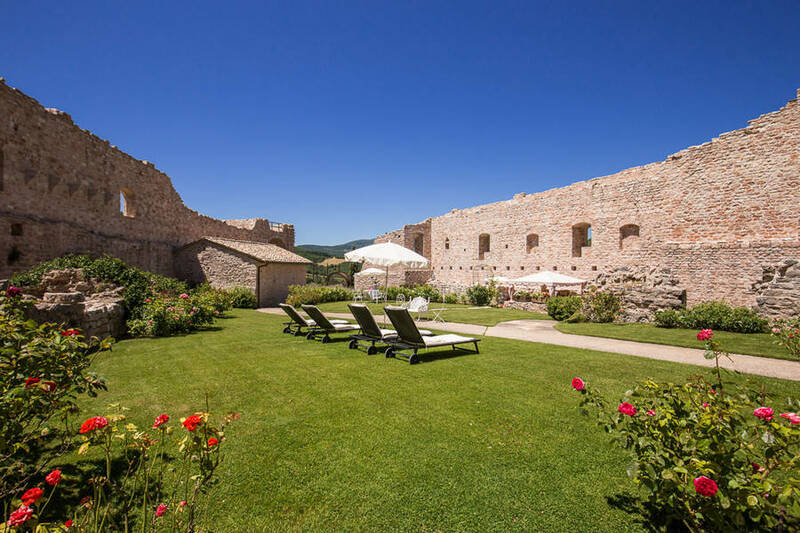 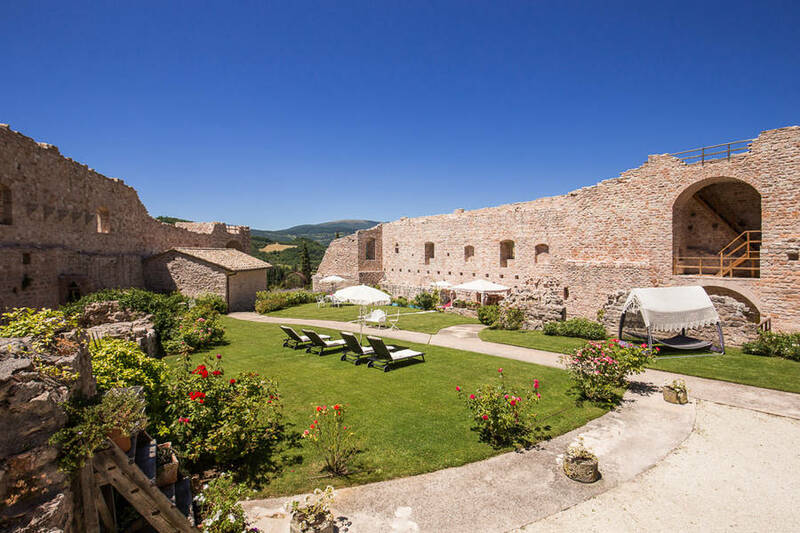 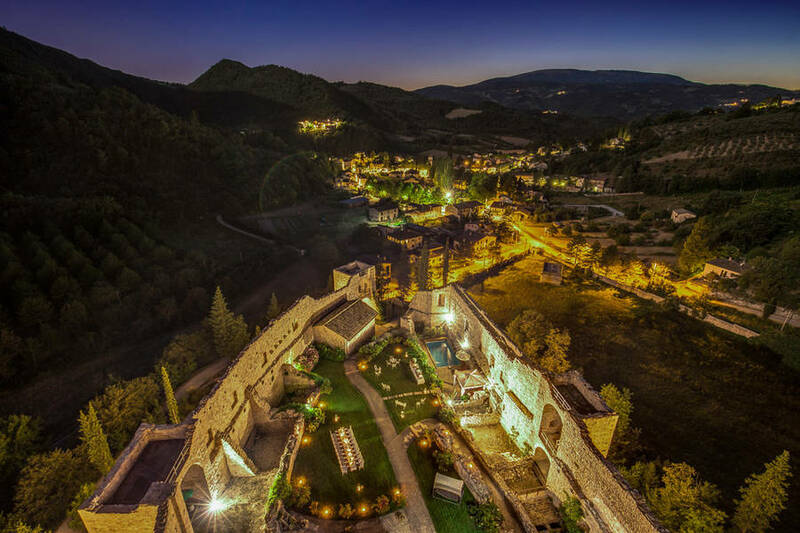 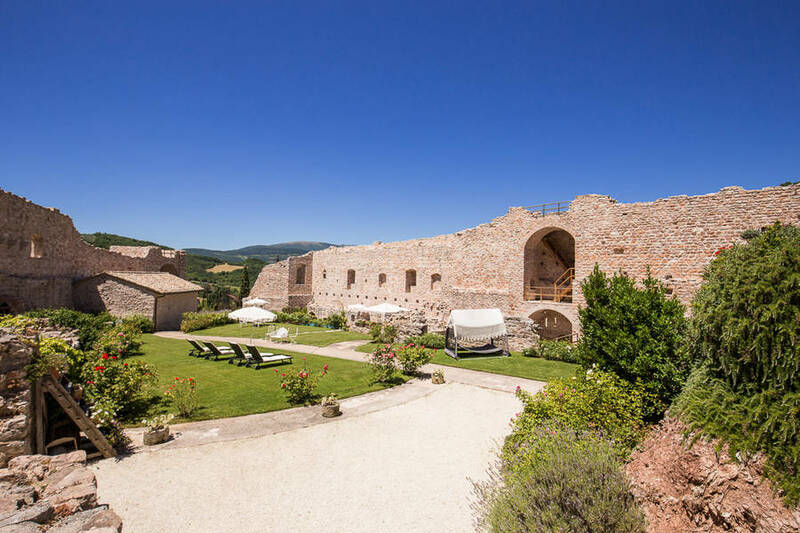 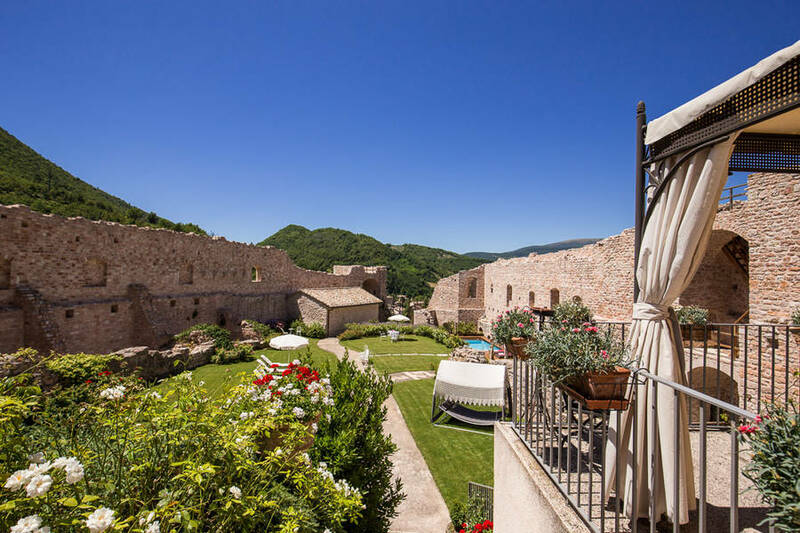 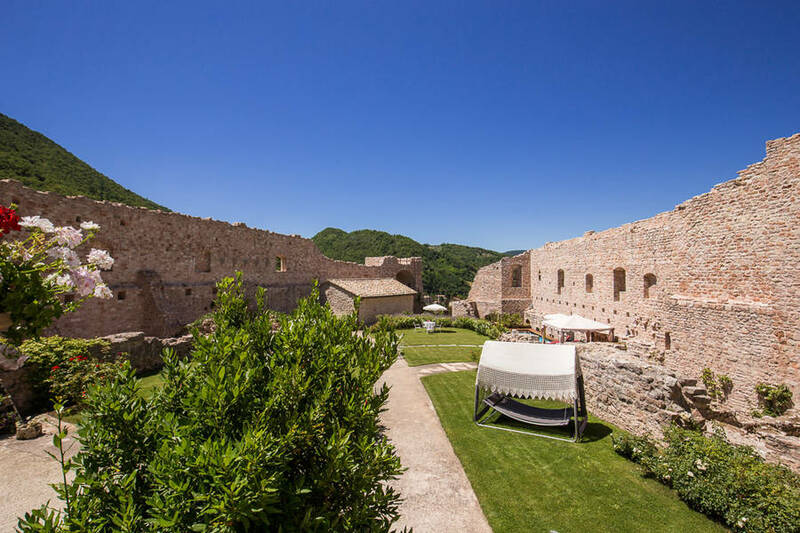 In the green heart of Umbria, surrounded by the wooded hillsides of Capodacqua di Foligno, La Rocca dei Trinci welcomes guests with an elegant central courtyard surrounded on three sides by the original fortress walls. 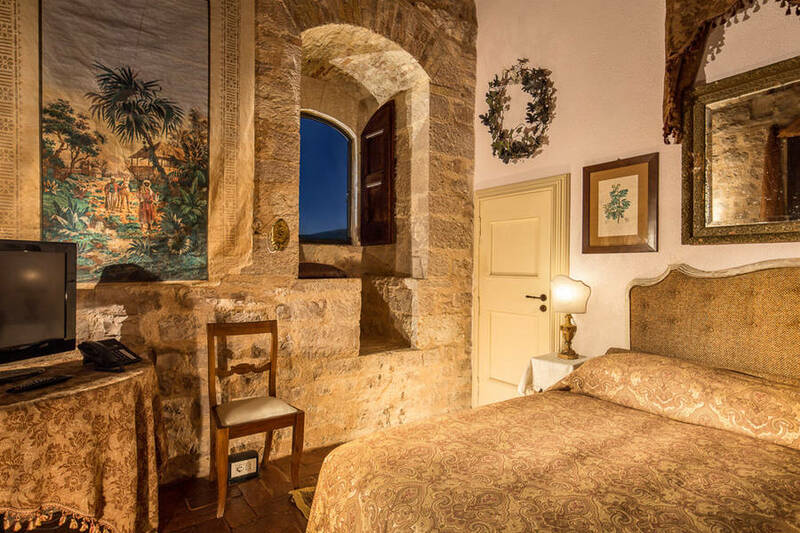 Rooms are in the former garrison and tower, the latter of which is home to four of the five guests rooms at this stunning historic residence. 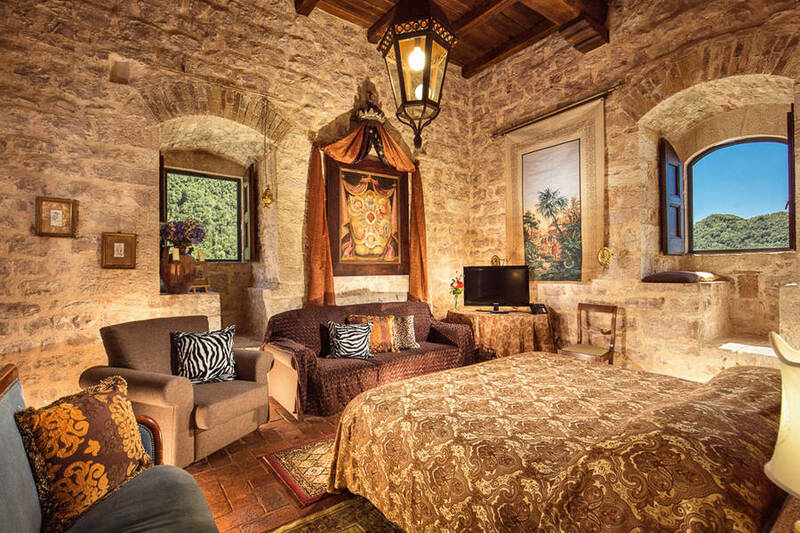 The garrison, which is connected to the tower by a large outdoor terrace, is where the castle's fully-equipped kitchen is located, which is also used as the castle dining room, and a large deluxe room on the ground floor with an adapted bathroom for guests with limited mobility. 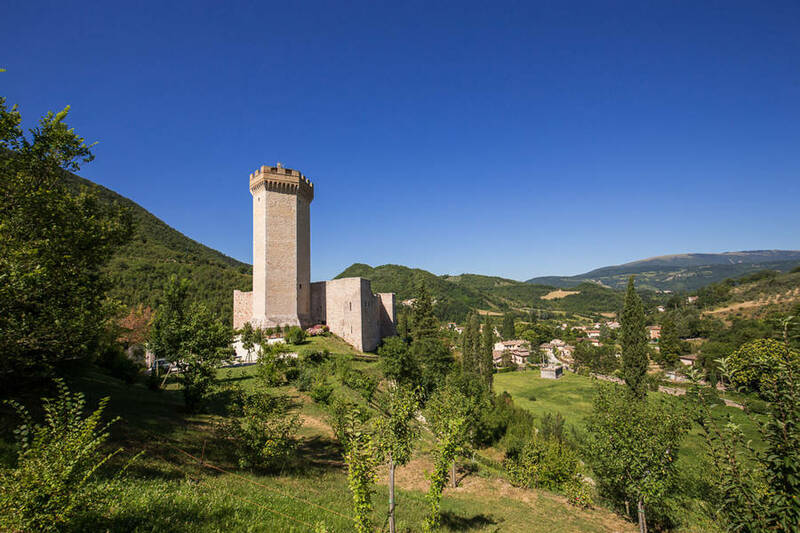 The crenelated Guelph tower has been perfectly preserved through the centuries and stands 32 meters above the surrounding countryside. 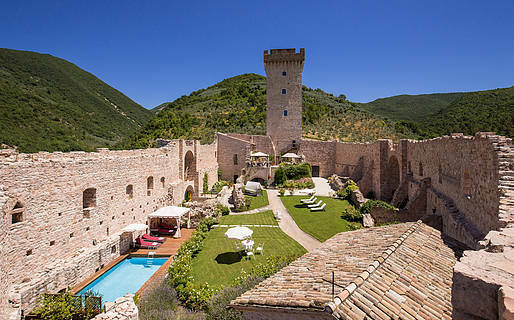 Its four levels are where the castle's 3 deluxe rooms and suite are located, the latter on the top floor of the tower. 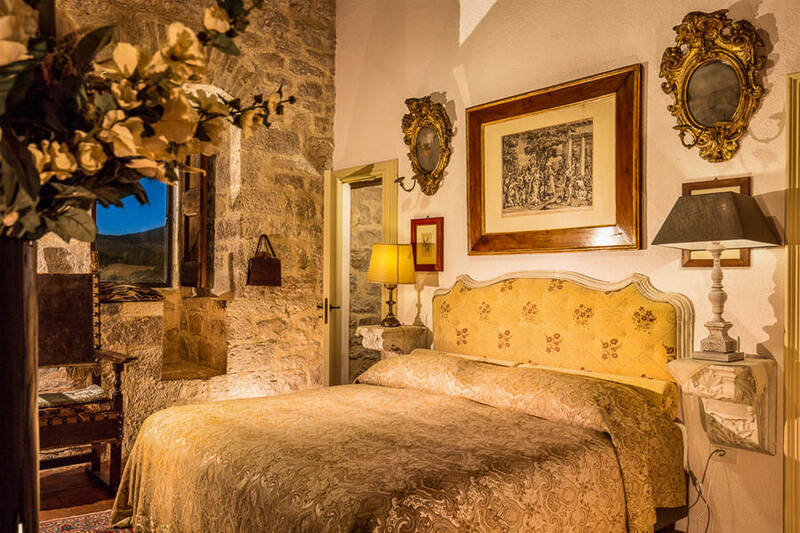 The guest rooms are all elegantly furnished with 18th century antiques and period pieces, creating an atmosphere rich with history and romance. 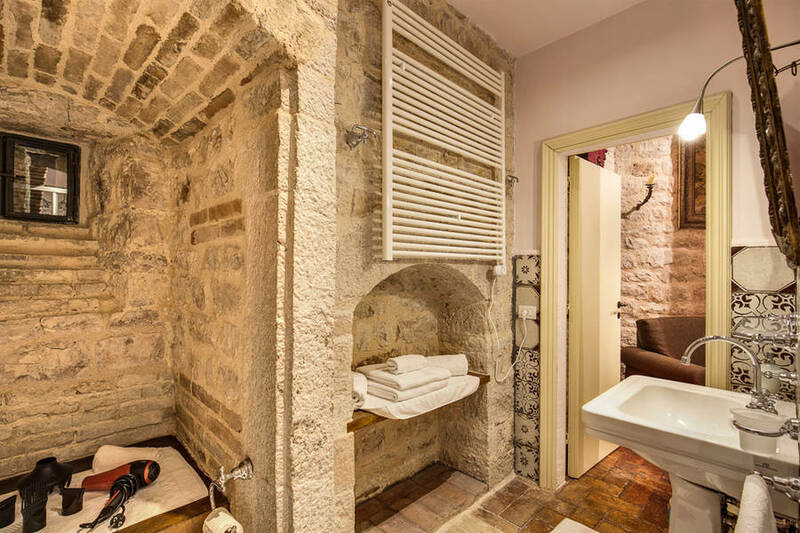 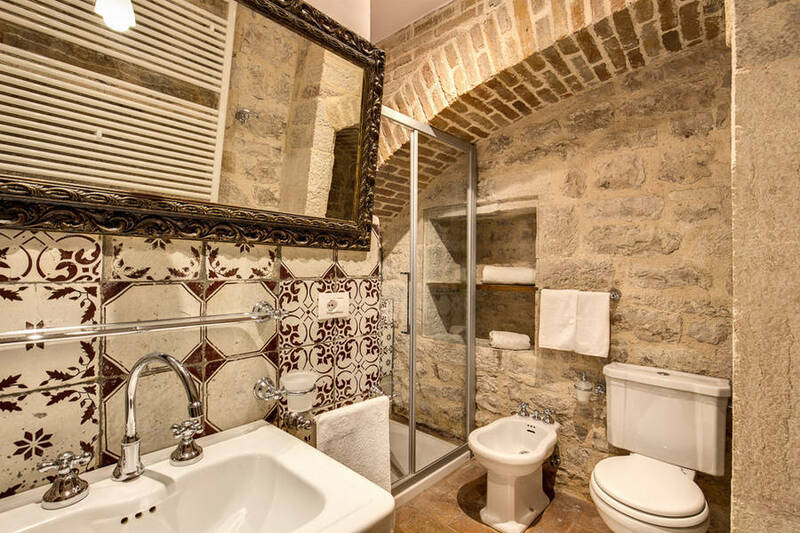 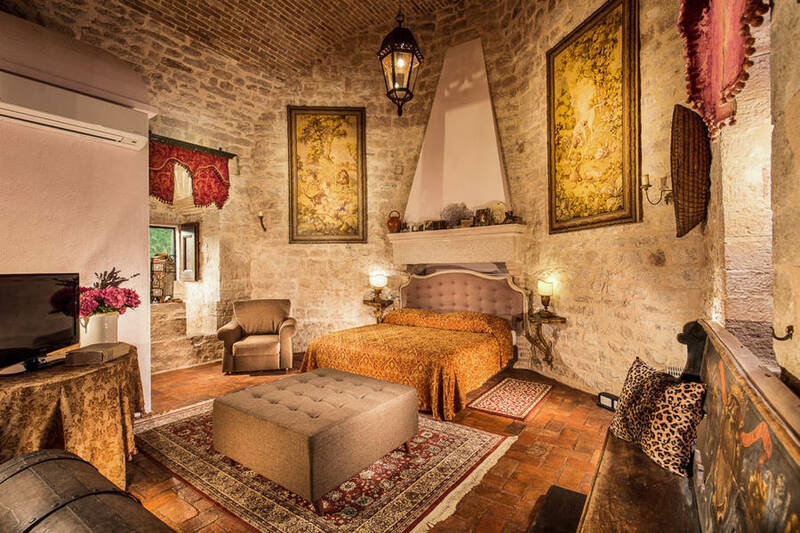 The tower rooms also have ceilings that are either vaulted or beamed, exposed stone walls, and stunning views. 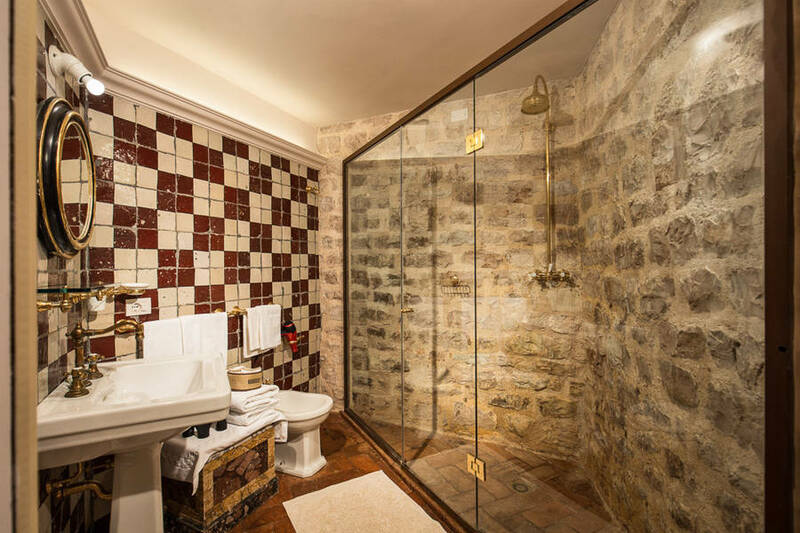 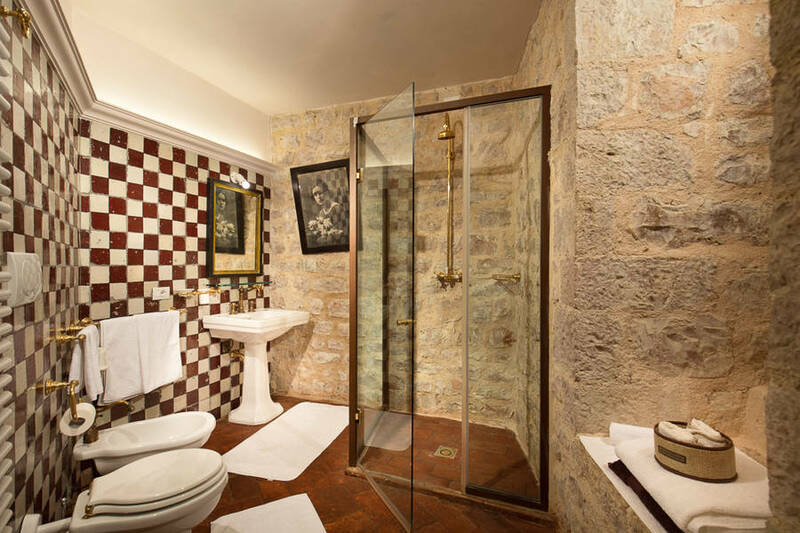 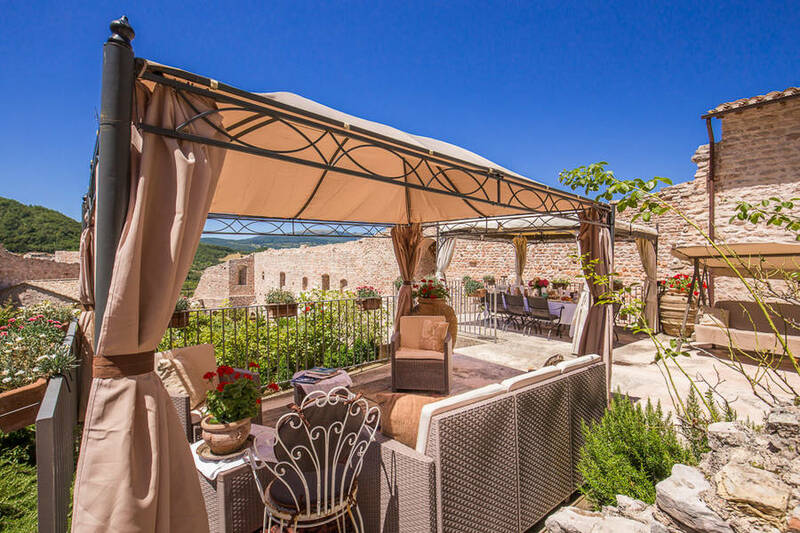 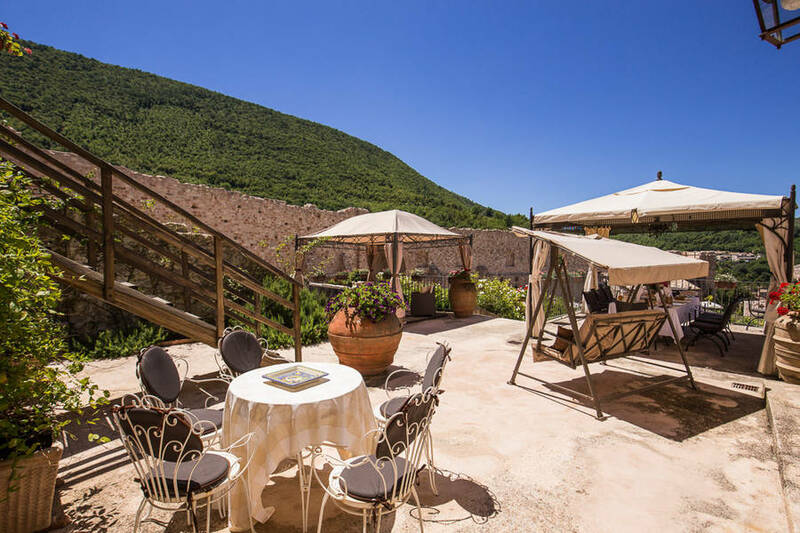 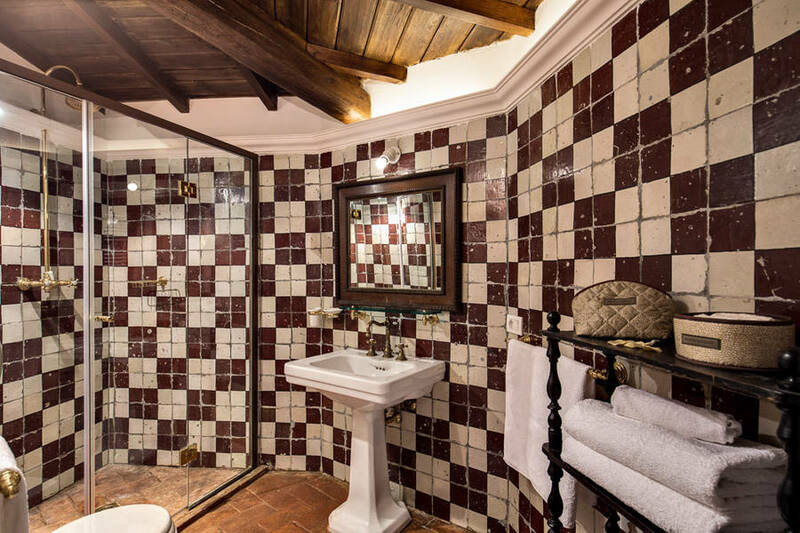 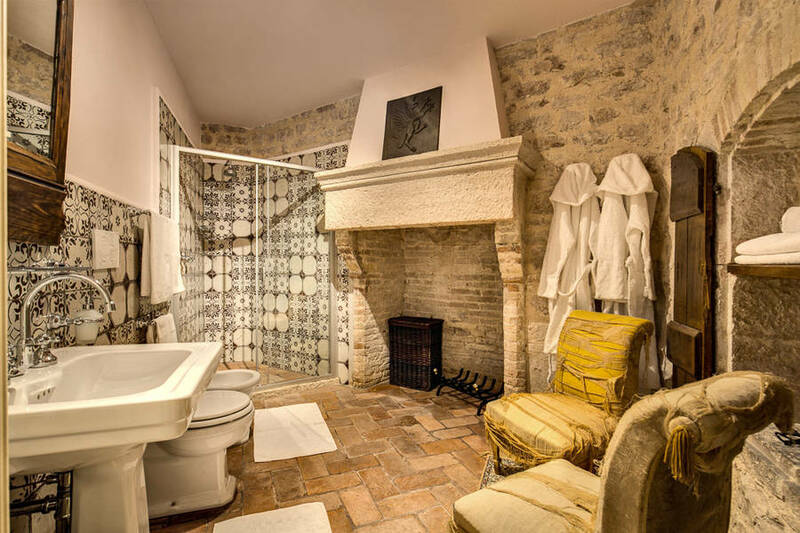 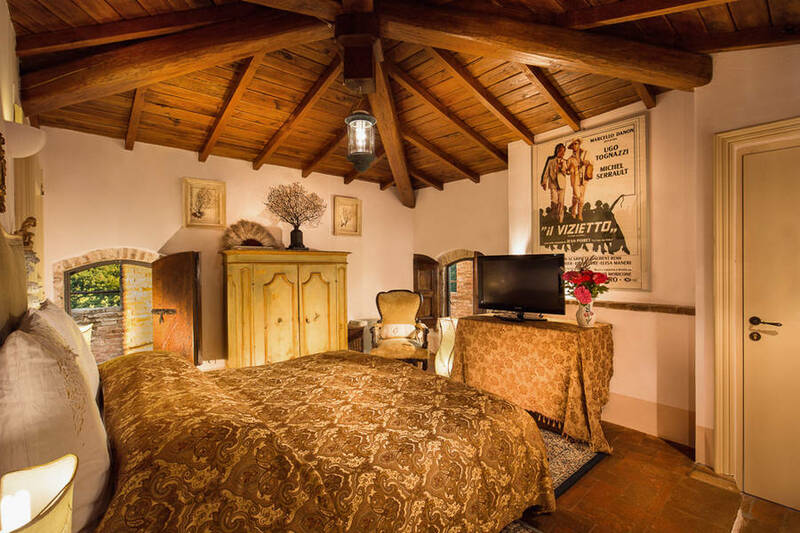 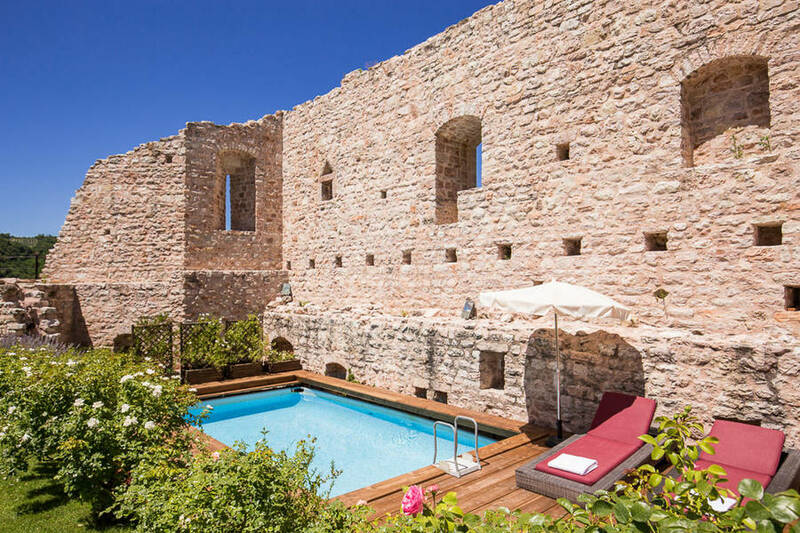 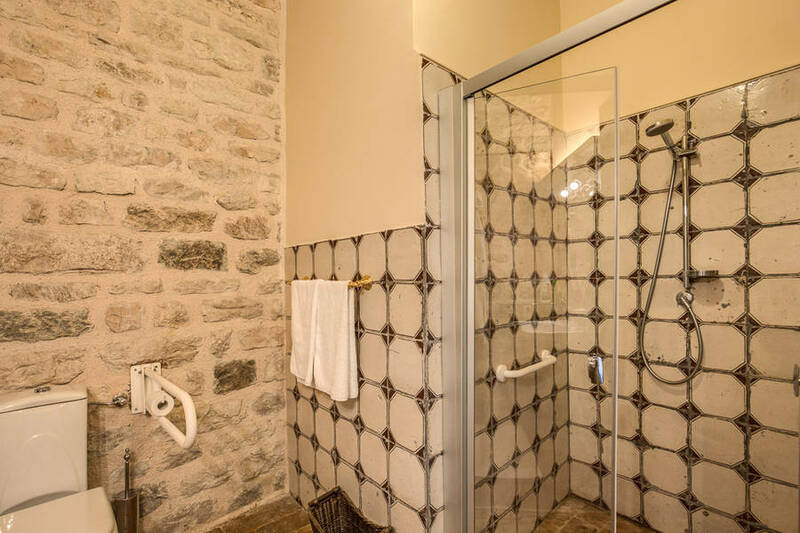 The Assisi Luxury Suite includes a large private terrace at the top of the tower, with a breathtaking 360° view over the castle grounds and the pristine hillsides to all sides! 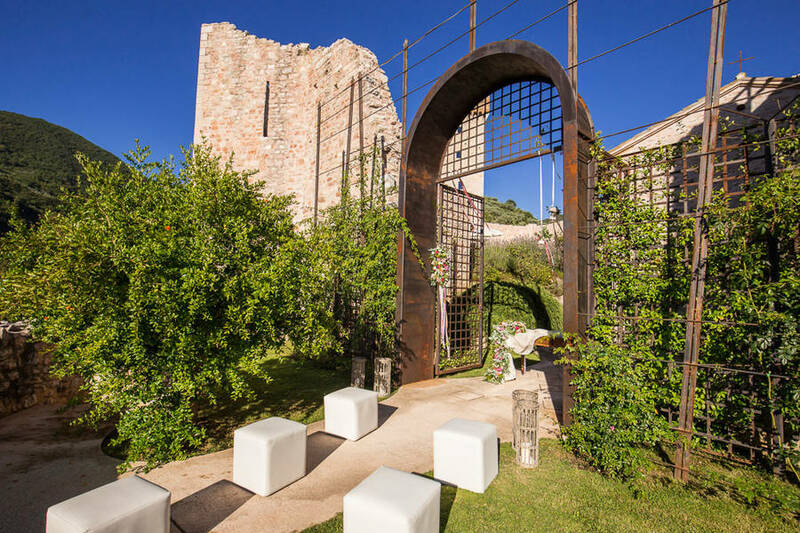 Guests can relax in the lovely garden, with pretty paths and blooming flowers, surrounded by the original medieval castle walls on three sides. 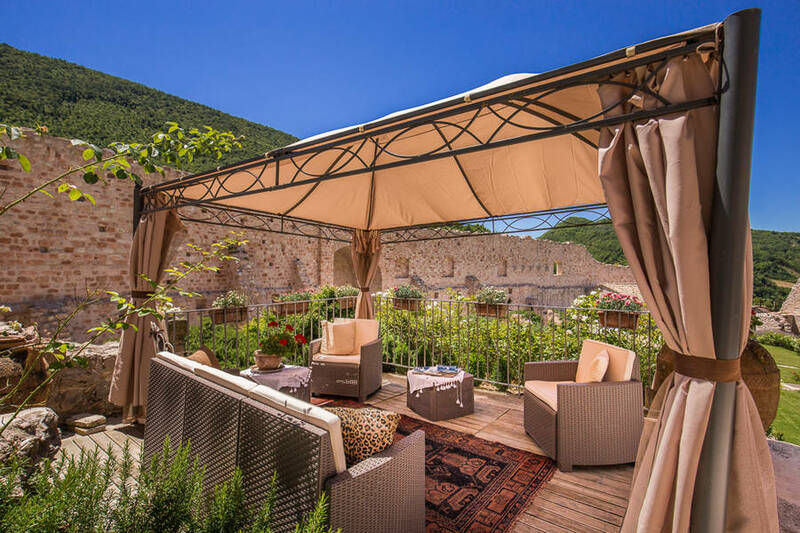 Spend a day here soaking in the outdoor pool, napping on the comfortable loungers, or sipping a drink under the shade of the furnished gazebo. 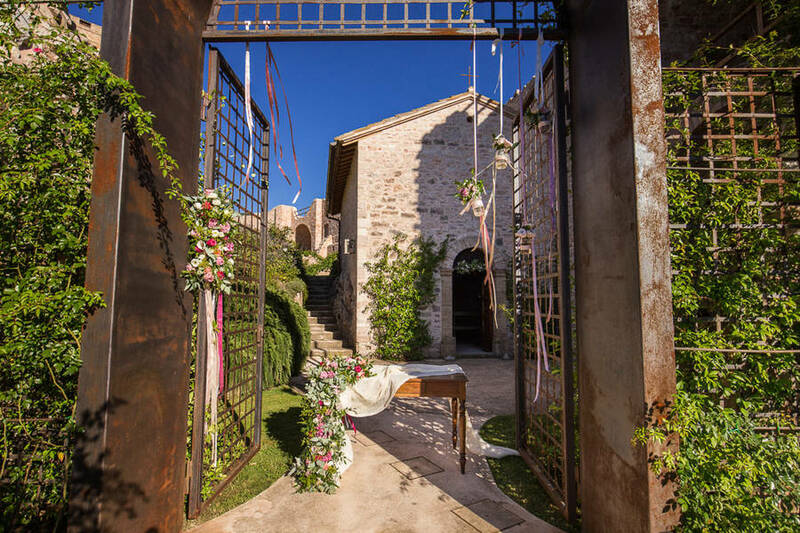 Time will seem to stand still in this timeless realm of beauty! 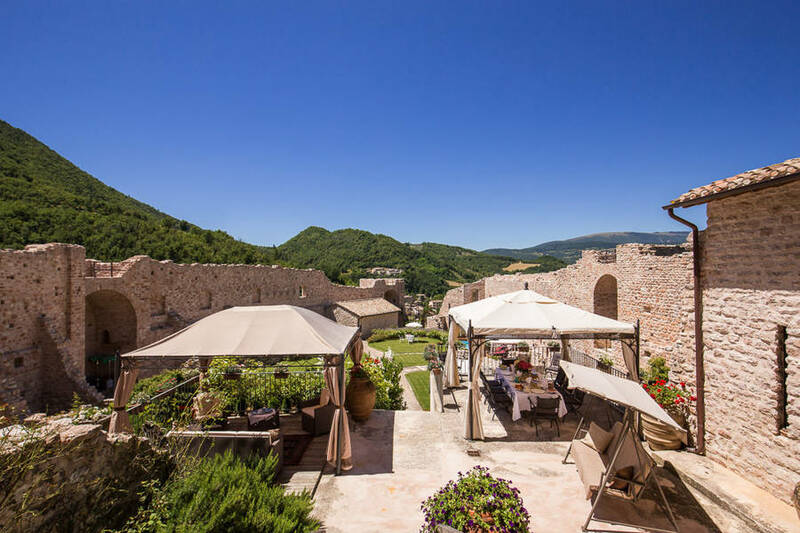 Your day will begin perfectly with the homemade Continental breakfast served each morning al fresco on the terrace and featuring all the best Umbrian specialties prepared by our chef with the freshest local and seasonal ingredients from across the region. 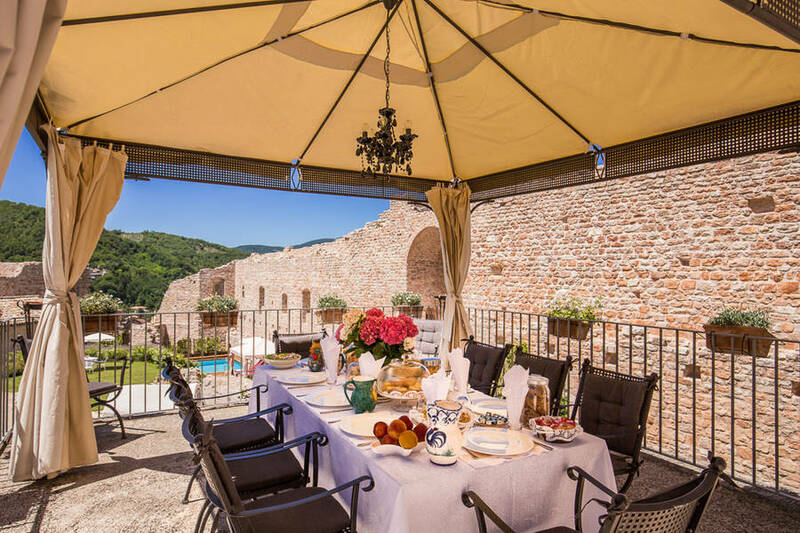 Linger over your coffee and cake while you savor the views over the lovely courtyard and stunning surrounding countryside. 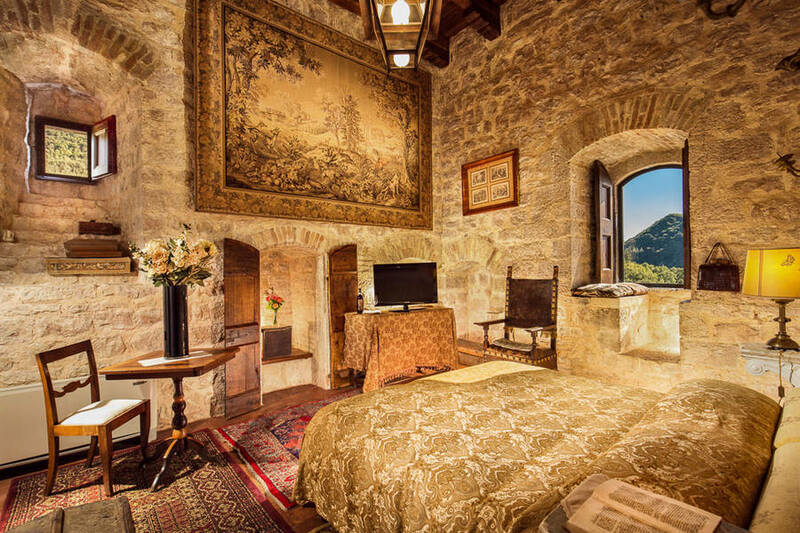 A regal view from a regal perch! 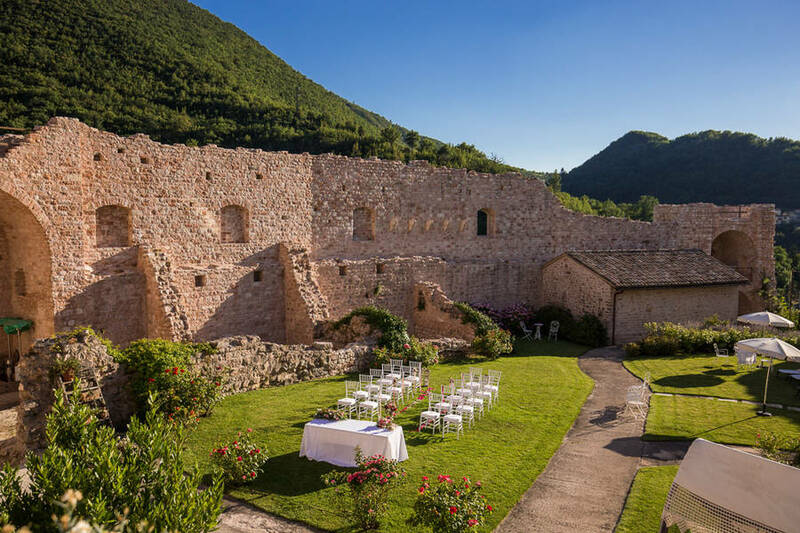 La Rocca dei Trinci is the perfect venue for a regal wedding! 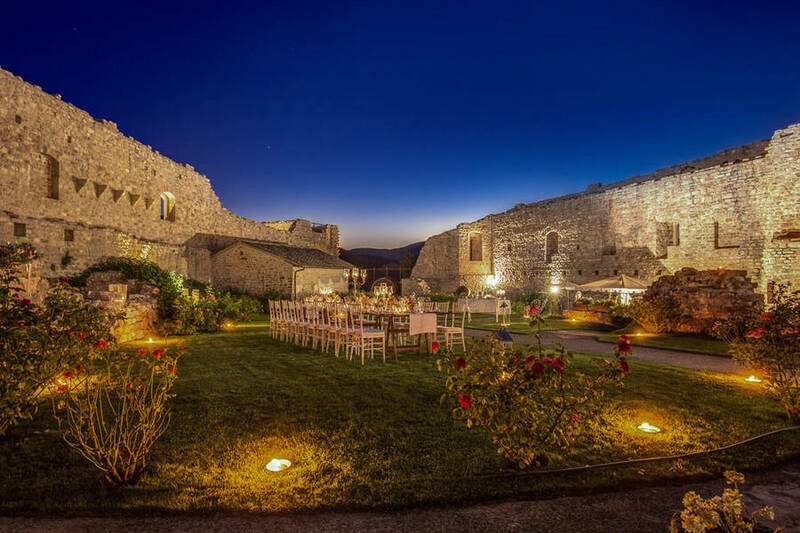 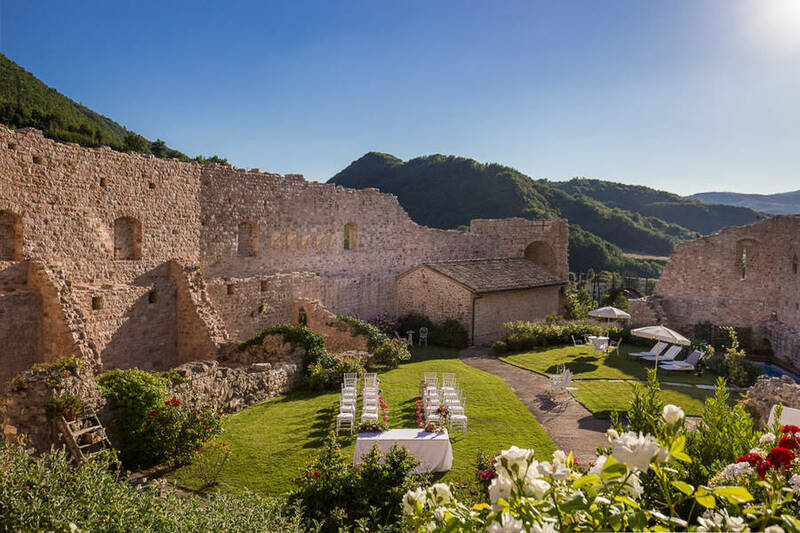 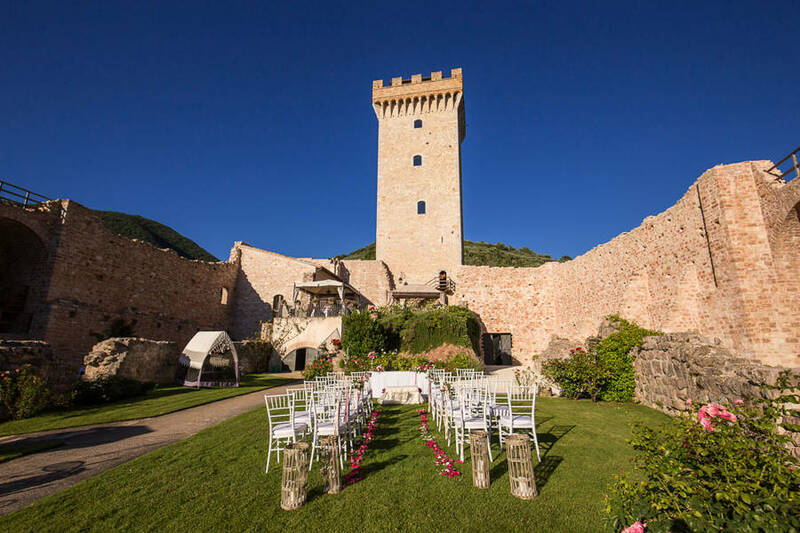 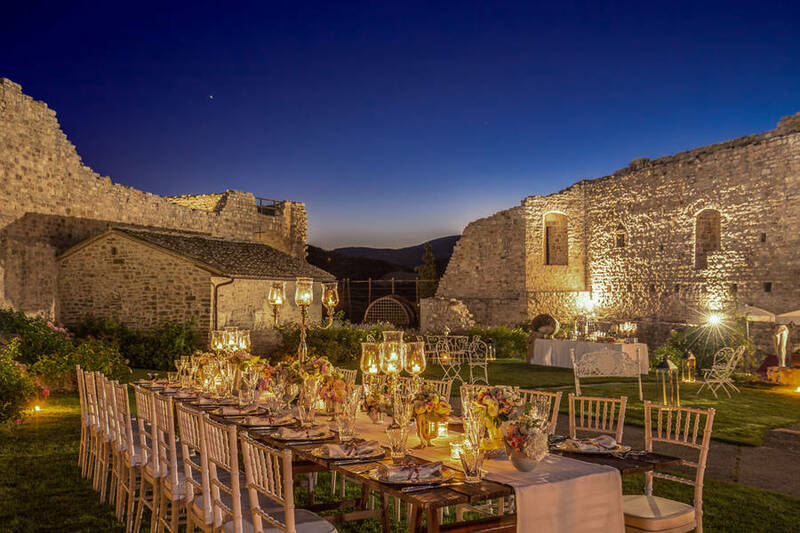 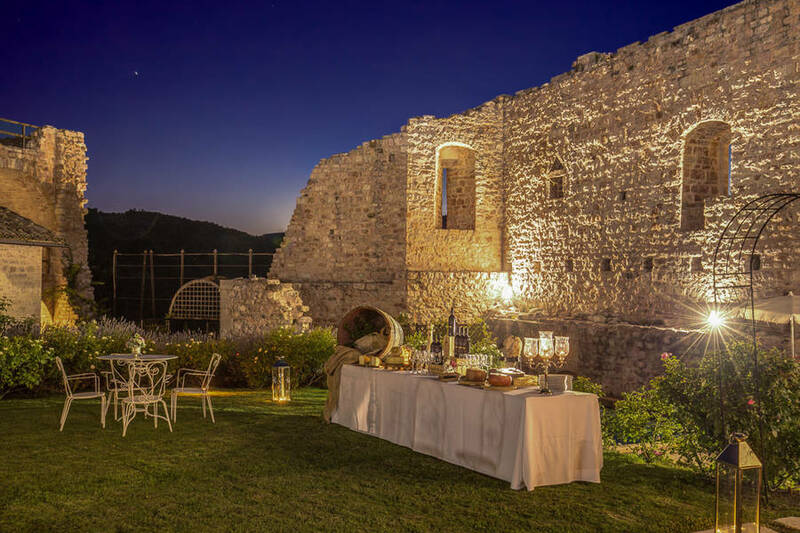 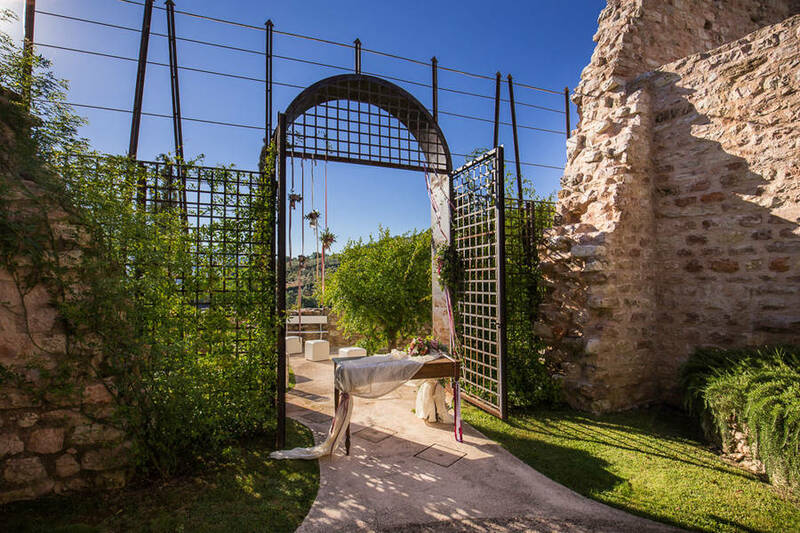 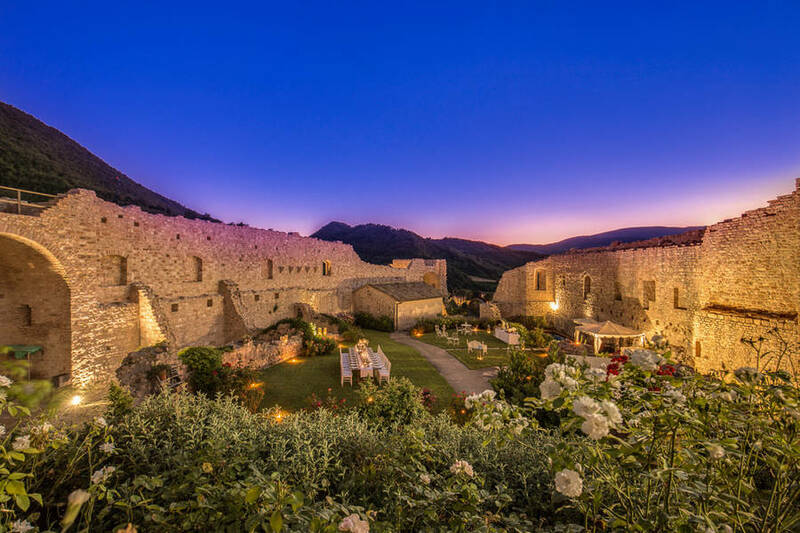 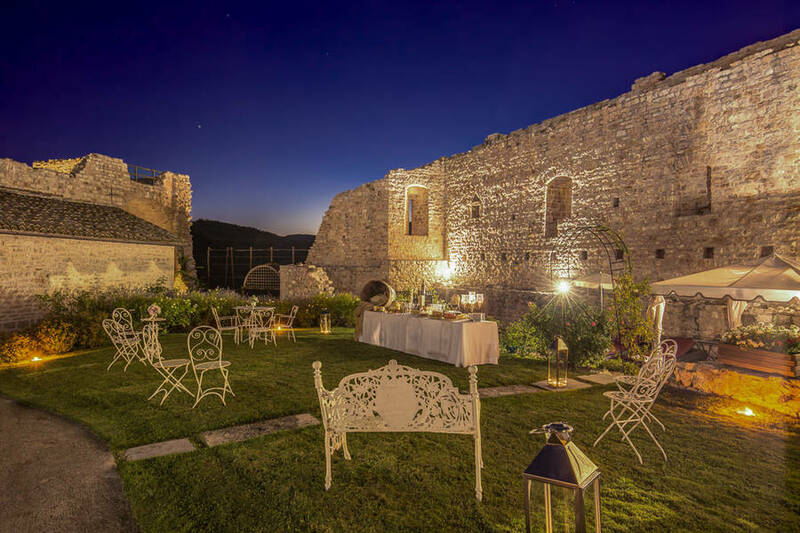 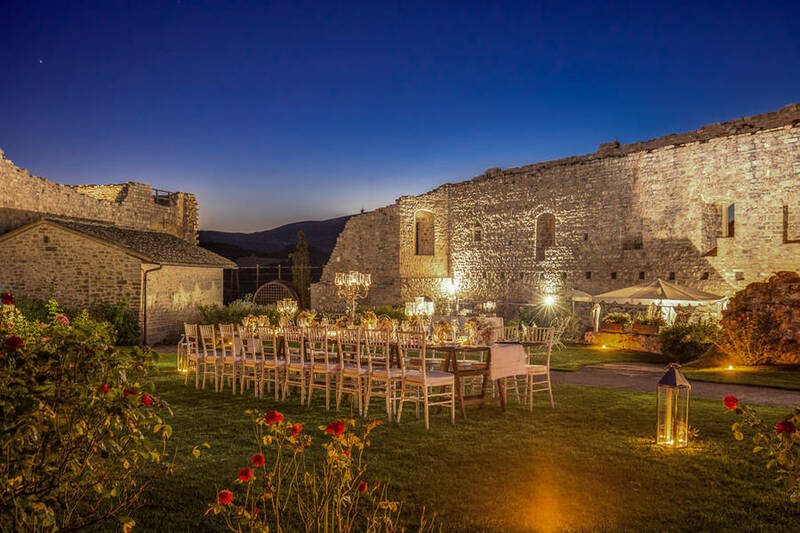 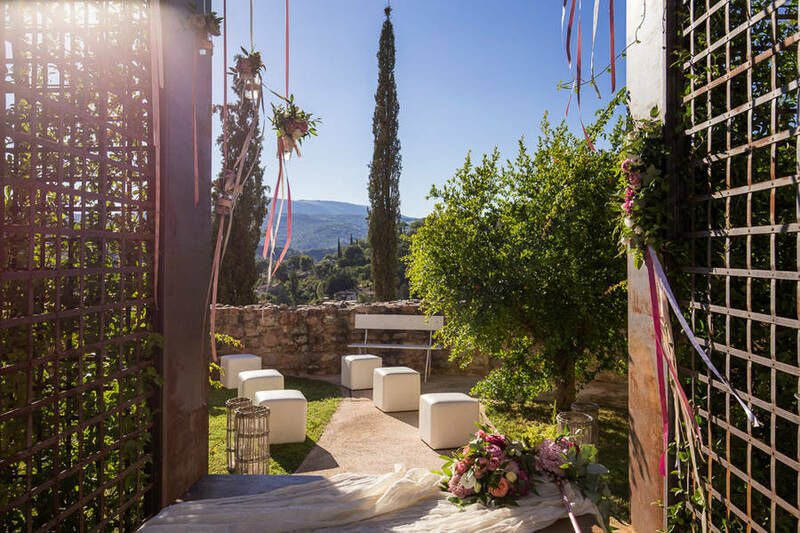 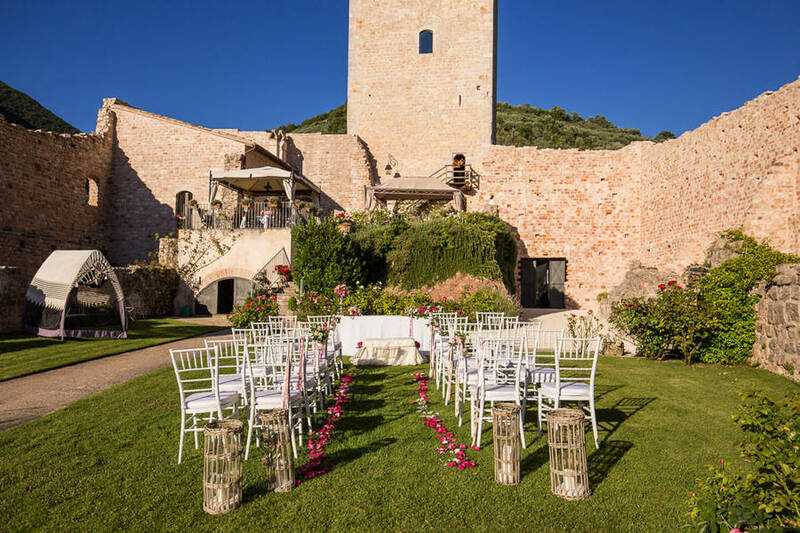 Italy's top wedding planning agency, Regency, will make sure the castle is transformed into your fairytale location, with the garden decorated with flowers, the reception set up under the stars, and an elegant yet personal feel to your day. 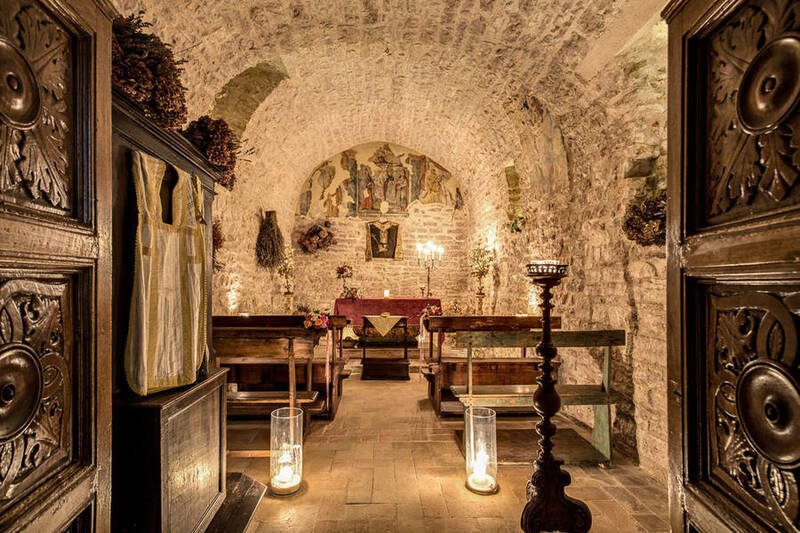 You can hold a Catholic service in the small castle chapel, or a civil or symbolic service in the historic courtyard. 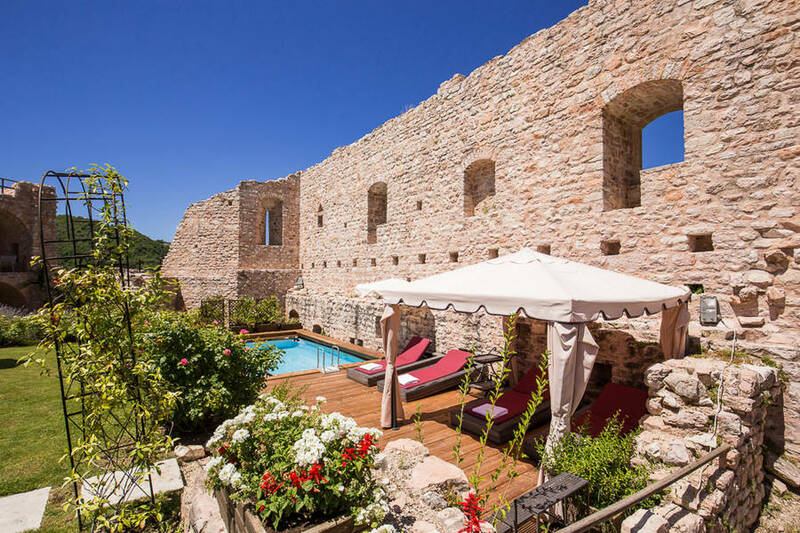 The castle offers all the amenities of a five star residence, including an expert concierge service to help organize day trips and private tours, wifi throughout the castle, and a personal chef upon request. 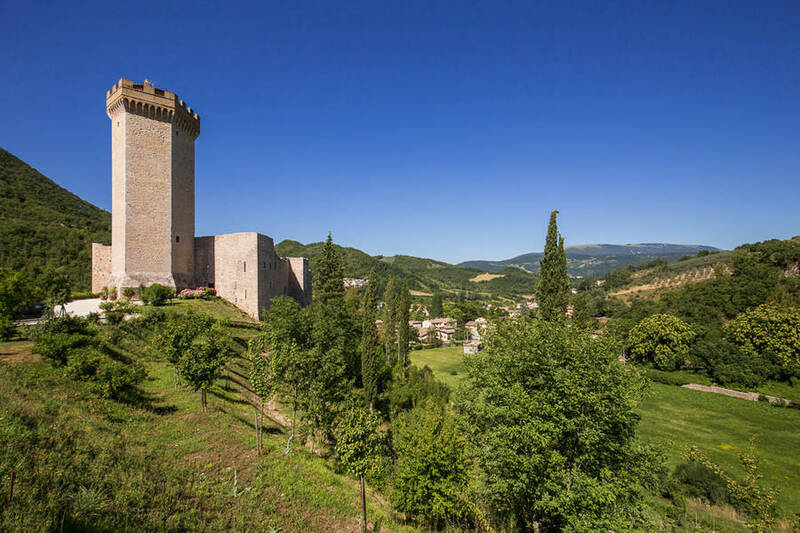 La Rocca dei Trinci is located on a hilltop just outside the Umbrian village of Capodacqua di Foligno in the province of Perugia. 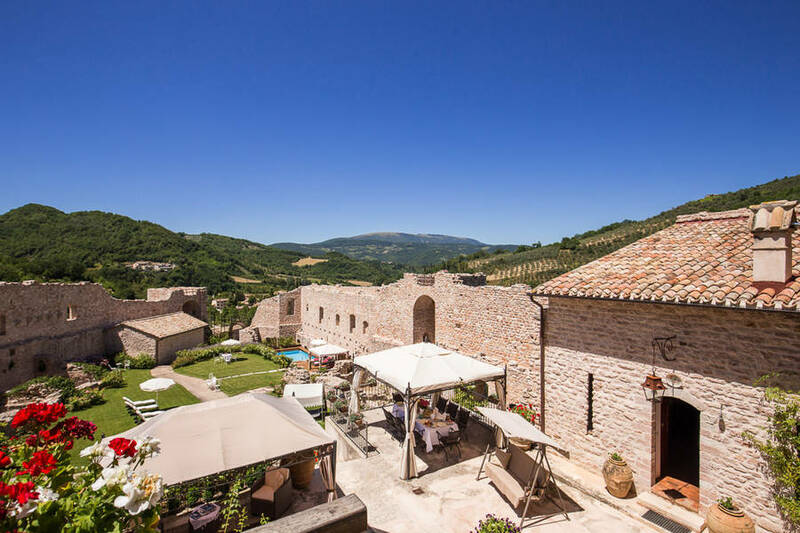 Guests can reach the center of town on foot, and the castle is perfectly positioned to discover all the most beautiful towns in Umbria, including Assisi (30 km), Perugia (47 km), Spoleto (54 km), and Gubbio (60 km). 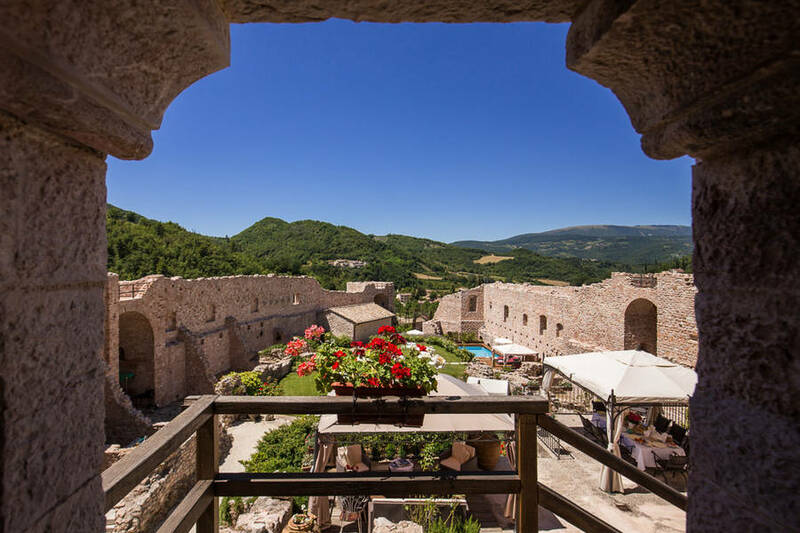 The concierge service at Rocca dei Trinci can help organize day trips and tours to all the area destinations.